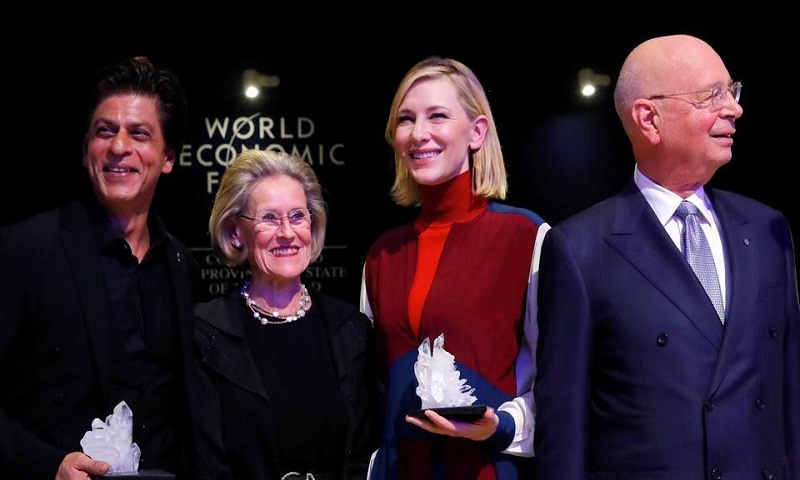 Bollywood superstar Shah Rukh Khan was at his wittiest best in Davos on Monday when he asked actress Cate Blanchett for a selfie publicly and immediately quipped that it may leave his children embarrassed, sending the audience into peals of laughter. Khan received the 24th Crystal Award on Monday at the World Economic Forum in Davos for “his leadership in championing children’s and women’s rights in India”. English singer Sir Elton John and Australian actress Cate Blanchett were also honoured at the event. “I am genuinely and deeply grateful for this honour. It is indeed a privilege to be in the company of two phenomenal and extraordinary human beings and talent, Cate Blanchett and Sir Elton John,” Khan said. He talked extensively about his social initiative, which he has named after his father, and the reason for the same. The 52-year-old cine star also thanked his late mother, wife and his daughter for inspiring him. After thanking the WEF for the award, Khan finished his speech with namaskar and ‘Jai Hind’. He was presented the award for “his leadership in championing children’s and women’s rights in India”. Earlier in the day, he also posed in his signature open arm style right after reaching Davos. Khan is the founder of the non-profit Meer Foundation, which provides support to female victims of acid attacks and major burn injuries through medical treatment, legal aid, vocational training, rehabilitation and livelihood support. The mega star has also been responsible for the creation of specialised children’s hospital wards and has supported childcare centres with free boarding for children undergoing cancer treatment.